Hiya guys. Half way done with the week and I can't wait till the weekend to visit the doctor. Sounds so weird, but honestly I have to come to terms with the fact that my back isn't healing as it should. It's time for medical attention, hopefully it's nothing too insane and only requires minimal physical therapy. I barely had it in me last night to create this mani, but I pushed through because I really wanted to participate. That's right guys, after a few months I'm finally taking part of the 'He Picks My Polish Challenge' again! This has always been on my favorites and hated not having the time for it in months. Before I had much of a chance to think it over, my best friend Adam jumped at the opportunity to pick. And thanks to my nail bestie, I came up with this mani last night. What do you think guys? I'm glad that Adam decided to stick to some normal creme polishes and not go crazy. I think he was just excited that I was involving him in these challenges again, he secretly missed them. Although I could of used vinyls or striping tape for cleaner line work, I felt this mani looked better with the imperfect lines. In some ways, it was a lot easier not having to worry about slightly crooked lines and whatnot. I used some water mixed with the polish to ease the brush along my nail. I also made a little tutorial, which will be posted on my Instagram @roselynn787. Now that I think about it, it's kind of funny I did plaid nails because Adam actually hates that pattern. I personally love plaid shirts, went through a whole phase where that's all I would wear a few years back. So tell me guys, are you a fan of plaid? Don't forget to check out the other ladies participating in this challenge in the linkup below. This is a great design for the colors chosen. I am also a member of this group but sadly have only been able to participate twice. My boys want nothing to do with nail polish and my Boyfriend thinks it's silly. At least he supports other parts of my blog or he'd really be in trouble. =) I hope they figure out your back situation and it's a simple fix! Sending relaxing vibes your way to lessen the pain. I like plaid under the right circumstances. HA! You made it look so fun and cute! Nice job! Agreed! I'm curious how my hubs will do next month when it's his turn. Looks great! 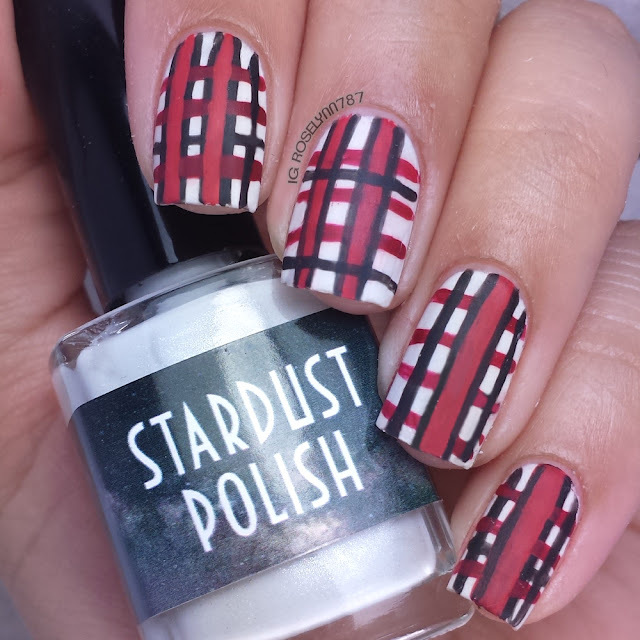 Plaid nails are such fun! Omg those are adorable! You have some serious skill! This is so cute! Hope your back gets better! oh I really like it. I love plaid myself. Turned out great! I adore this so hard! I really hope your doctor visit helps you out. Thanks. I hope so too. Will definitely keep everyone posted. I love plaid patterns! I have a couple skirts and I used to have a dress that I loved. Your mani is super pretty! I hope your doctor finds out what's up and you can get well soon! Thank you. 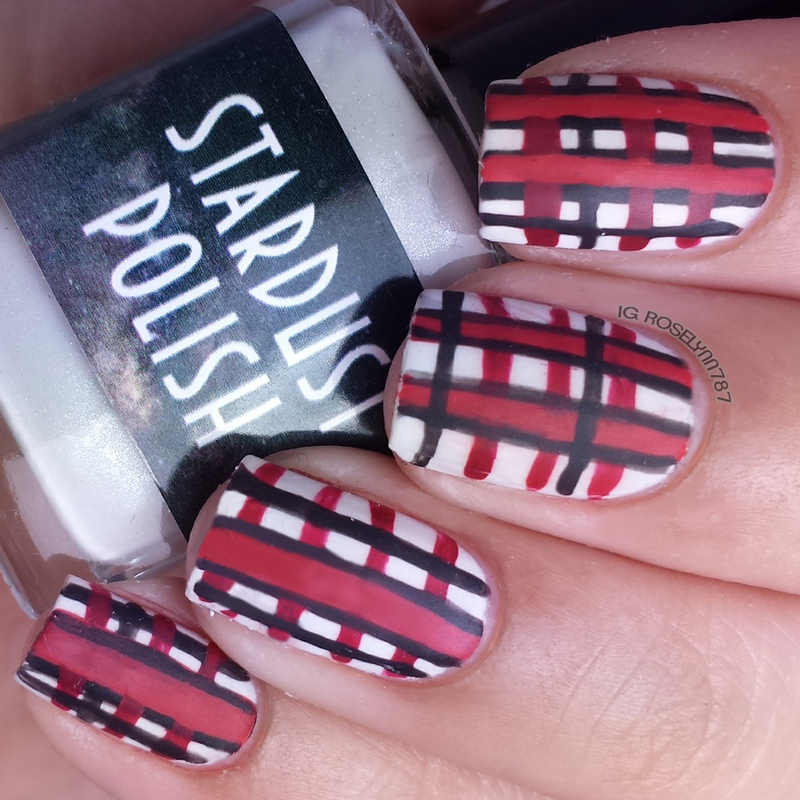 I love plaid too, this design actually made me find all my plaid shirts from years ago haha. These look awesome!! Your lines came out so great! Oh my your nails are so cute and creative.